Why the Hell Is Delta Spending $50 Million on Bag-Tracking Technology? The busiest airline in the world just spent $50 million on tech that promises to more efficiently route your checked luggage to its destination. By the end of the year, all Delta Airlines flights will be tracking bags using RFID, or radio frequency identification. But can RFID really solve one of the most annoying things about air travel? 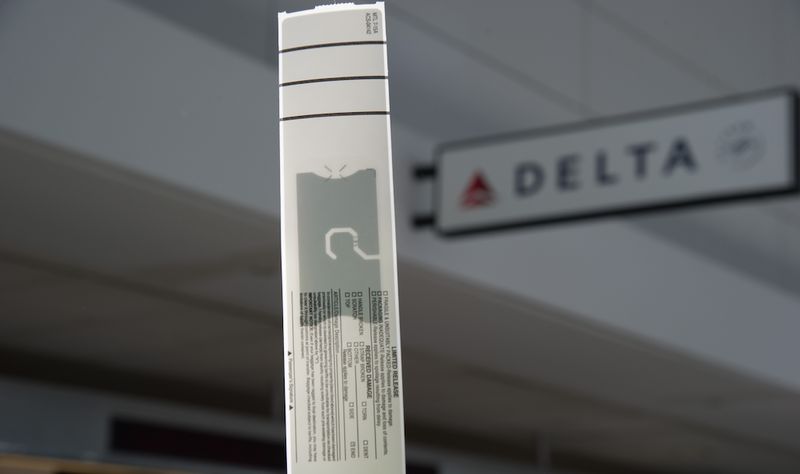 Delta has announced that RFID chips embedded in bag tags will be standard by the end of 2016, helping the airline to manage its load of 120 million bags per year. The RFID-enabled tags look just like regular barcode tags, but with tiny chips inside that are able to communicate more effectively with airport-scanning infrastructure. In addition to more accurate real-time location updates for each bag, the improved scanning system means fewer mistakes are made by luggage handlers en route, and it also allows bags to be easily tracked by passengers via an app. The $50 million is paying for thousands of new bag tag printers and upgraded sensors in 344 airports. RFID is not in any way a new technology, nor is it new to baggage-tracking. Qantas, Alaska, and Lufthansa have experimented with the technology by allowing passengers to upgrade to RFID tags or use luggage already embedded with RFID chips. Hong Kong’s airport famously launched an airport-wide RFID system back in 2009, and here in the US, Las Vegas McCarran International took its pilot RFID project airport-wide in 2012. But a deployment on Delta’s scale hasn’t ever happened—mostly because it’s an incredibly pricey investment. In fact, a Delta representative confirmed to me that the airline has been testing RFID since 2003 but that it has only made the decision to implement it now because the costs of revamping the entire ticketing system have finally come down. Mark Roberti, editor of RFID Journal, sketched out some compelling math for why such a big investment would be worth it if airlines are handling more and more bags per year, especially when a mishandled piece of luggage costs an airline about $100 per bag. But when you look at industry trends, that’s not the case: Baggage mishandling is already at an all-time low, even as the number of passengers has increased. According to a brand-new report out by SITA, an airline industry tech company, an amazing 99.68 percent of US passengers had their checked bags properly handled in 2015. As an airline, Delta is actually not-awful at handling bags—it’s one of the best. Why is lost luggage much less of a problem than it was a decade ago? Well, there are fewer bags to lose for one; fewer people are checking bags due to fees (Delta, for example, charges $25 for the first and $35 for the second). But the biggest improvement is that through all sorts of innovations, airlines have improved their on-time arrival rates, which means there’s a better chance that bags will make their connections. Delta is also better at this than anyone else. Of course, no bags should be lost, ever, and the entire system can certainly use improvements. That’s why in 2018, the International Air Transport Association (IATA) will require all airlines worldwide to prove they have “end-to-end tracking” systems to prevent losses. Delta’s RFID plan certainly fulfills this requirement. But there’s a simpler solution already in the works. SITA, which handles IT services for about 95 percent of the world’s airports, has introduced its own globally standardized system for tracking bags that uses existing technology. And IATA recommended in 2015 that airports, not specific airlines, make upgrades to new tracking technology so airlines aren’t duplicating efforts. “It would be foolish to have every airline at a busy airport each introducing their own tracking solutions, when the places being tracked are often common use,” said Andrew Price, IATA’s Head of Airport Operations. Airports might want to hold off on those investments, too, thanks to new consumer-facing innovations in bag-tracking tech. The future is not necessarily draping airports with disposable chip-printers. A reusable “e-tag” with the ability to beam its data and location to an airline or your smartphone at any time using RFID or GPS makes more sense. This way you can simply upload upcoming flight information to your e-tag via Bluetooth while you’re packing, then toss your bag on the belt when you get there. No printing necessary—and no chance of a lost or damaged paper tag. No matter how smart our luggage is, or what tech upgrades an airline invests in, the humans who handle our bags will still be making mistakes. Until bags are lifted onto autonomous trolleys and loaded into planes by robots (now there’s $50 million well-spent! ), RFID won’t help with the fact that some of these bags will be forgotten, stolen, and driven over by jets. RFID can be an important step towards fully automated baggage handling—more efficient scanning eliminates the need for more handlers—but only if the entire airport is set up this way. Right now, Delta bags that are connecting to and from different airlines outside of their terminals will need to be retagged with traditional barcodes by hand. That seems like a weak link in the system that could mean more losses. Which brings me to my last point: Why would you ever, for any reason, check a bag? The only situations I can think of are if you are traveling with kids, physically unable to take your bag to the gate, or need to transport large quantities of liquids. Checking a bag means you’re paying more to be physically separated from your belongings and must wait up to an hour to be reunited with them in the constipated bowels of an airport. Ain’t no RFID in the world that’s gonna save you from that experience.